System 55 (2015), Analog Synth Rack/Sound Module from Moog Music. Moog has just announced that they are going to recreate three of its most sought-after 5U modular synths in limited quantities. 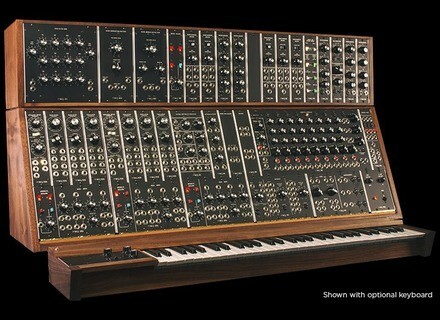 The Moog System 55, System 35 and Model 15 has been manufactured in 1973. A few fortunate and wealthy fans will have the opportunity to put their hands on a 2015 limited reissue. The System 55 is the biggest of the three and only 55 copies will be built. It will include 5x 902 Voltage Controlled Amplifiers, 1x 903A Random Signal Generator, 1x 904A Voltage Controlled Low Pass Filter, 1x 904B Voltage Controlled High Pass Filter, 5x 911 Envelope Generators, 1x 911A Dual Trigger Delay, 1x 914 Fixed Filter Bank, 1x 921 Voltage Controlled Oscillator, 2x 921A Oscillator Drivers, 6x 921B Oscillators, 1x 960 Sequential Controller, 1x 961 Interface, 1x 962 Sequential Switch, 1x 992 Control Voltage Panel, 1x 993 Trigger and Envelope Voltages Panel, 1x 994 Dual Multiples Panel, 1x 995 Attenuator, 1x CP2 Console Panel, 3x CP3A Console Panels, 1x CP8 Console Panel and a 350 Watt 120 VAC or 230 VAC Switch Selectable Power Supply. 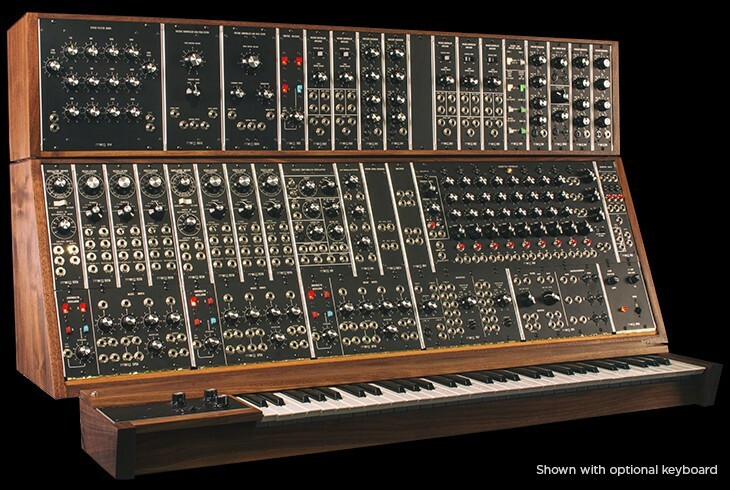 Moog announces a price of $35 000. The System 35 will only be available for 35 of you and will feature :3x 902 Voltage Controlled Amplifiers, 1x 904A Voltage Controlled Low Pass Filter, 1x 904B Voltage Controlled High Pass Filter, 1x 907A Fixed Filter Bank, 3x 911 Envelope Generators, 1x 921 Voltage Controlled Oscillator, 2x 921A Oscillator drivers, 4x 921B Oscillators, 1x 923 Random Noise/Filter, 2x CP3A Console Panels, 1x CP4A Console Panel, 1x CP8A Console Panel, 1x CP35 Console Panel and a180 Watt 120 VAC or 230 VAC Switch Selectable Power Supply. MSRP is $22 000. Last, the Model 15 offers 2x 902 Voltage Controlled Amplifiers, 1x 904A Voltage Controlled Low Pass Filter, 1x 907A Fixed Filter Bank, 2x 911 Envelope Generators, 1x 921 Voltage Controlled Oscillator, 1x 921A Oscillator driver, 2x 921B Oscillators, 1x 923 Random Noise/Filter, 1x 995 Attenuator, 1x CP15 Console Panel and a 130 Watt 120 VAC Power Supply (230 VAC available upon request). Pricing of the Model 15 is $10 000 and 150 synths will be manufactured. [NAMM] Studio Electronics goes modular We thought they were putting up resistance, but Studio Electronics were secretly preparing its sensational debut on the modular market. [NAMM] New Abstract Data Eurorack modules Abstract Data will complete is Eurorack analog module series in 2015 with 6 models that will be introduced at NAMM. Rare Waves Grendel RA-9 Grenadier monosynth Eric Archer, aka Rare Waves, will launch this Spring a new semi-modular analog monosynth, the Grendel RA-9 Grenadier.